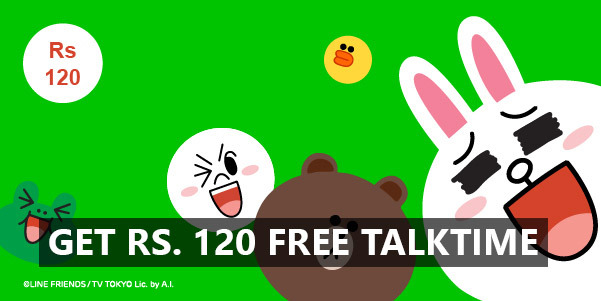 Home/Free Talktime/LINE Application Rs.130 FREE TALKTIME !!!! The popular Japanese Messaging application again introduced free Talktime of Rs. 130, Previously they offered a total of Rs.111 . What you have to do . Sent at-least one sticker everyday to any friend to receive free talktime Every 5 days. Don’t worry if you miss a day. 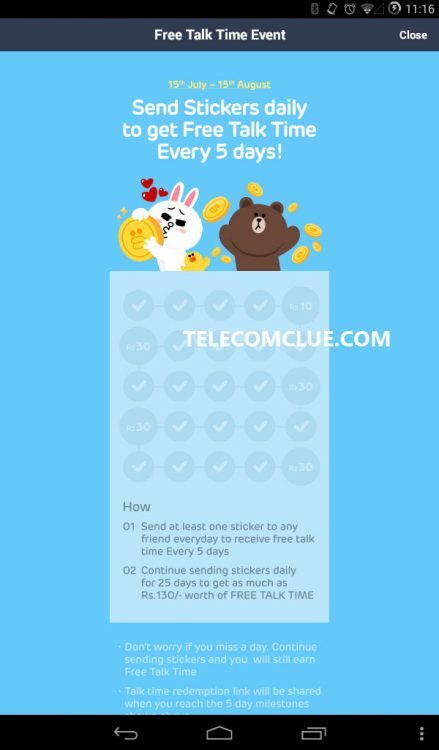 Continue sending stickers and you will still earn free talktime. I have not received talktime from Line yet,after I continously sent Sticker ……. I sent sticker everyday to my freinds I sent stickers 10 days nd I will receive messege abt 30 rs. bt I fill imformation… it comes error what I do??? Not Working – sir i iave a big problame on line . i recevied msg of free talktime but when i click on it then he show please try after 10 min. but i also try it after 10 min but i show this msg again nd again nd i don’t get talktime please help me . I was using this since five days jus, and i got talk time os Rs. 10 in 5 days. i dont know further will get or not? But got Rs. 10 in 5 days…. I m send daily 1 sticker to 5 diff frnds. after sending a stiker days mor left is not decrese. count remain same. Not Working – My 3rd and 4th link does not to be worked.It shows something went wrong please try again after 10 minutes.I try it lots of time but the recharge does not to be redeemed.please help to redeem. Usually problem is due to network congestion. this offer is not valid for windows phone?? Not Working – SIR IN RESPECT OF FREE RECHARGE ON SENDING STICKERS ON GROUP. I CREATED A GROUP AND I AM SENDING STICKERS BUT THE DAY CREDIT CHART IS NOT MOVING FORWARD WHAT TO DO PLEASE HELP. Telecom Clue i have same problem but i wish it fixd ….. I have not received talktime from Line yet,after I continously 5 day sent Sticker ……. Question – I Have Sending 5 sticker continue In My group but still i have not received free talktime on my number. WHY? Did you see icon which shows 5 days to go or something similar ? For the past 10 days i have been sending stickers in group, but till now i didnt receive any message regarding my recharge amount form line india, my friends and all get recharged but i didnt receive, immediately i want my recharge amount why are u doing like this? i dont get any ticks bt i snd stickers daily….